1) Reconstructionist religions are religions which attempt to reconstruct the religious practices and often the theology and mythology of an ancient or “dead” religion from Pre-Christian Europe, North Africa and the Near East. Sometimes they are called Revivalist religions. We do not usually try or aim to revive social structures or practices of those cultures. 2) This is because we focus on religous practice and try to adapt them to modern society and values. Some try to model our practice on how we think the religions would have evolved if Christianity had not interrupted their development. Others take practices and remove or adapt them to modern sensibilities. 3) Other reconstructionist religions include Asatru, Anglo-Saxon Theodish religion, Celtic Reconstructionism, Vedic Reconstructionism, Religo Romana, and Kemetic Orthodoxy. 3) Heresy from Hairesis “Choice” — in Ancient times one had a choice of gods, Mysteries, philosophical schools and the like, and there was little opposition to any particular choice, in stark contrast to some religions such as Christianity which focused on Orthodoxy and frowned on Heresy. 4) In modern times, such choice continues. Most of us have different theological points of view and practice various philosophies, though most of us study ancient philosophy and theology and draw inspiration from it. 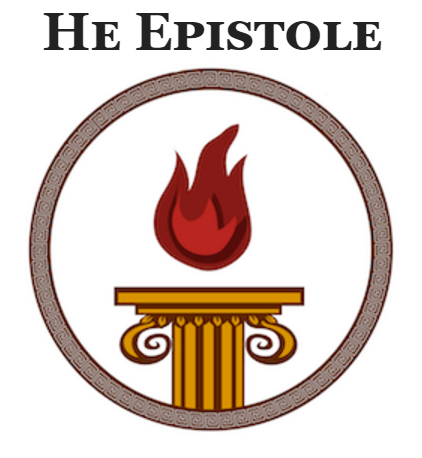 2) Most Hellenistai are Hard polytheists, which means we believe that the gods are distinct individuals with their own personalities. 3) Some Hellenistai are syncretists which means we believe that some deities (often from different pantheons) are related or identified with others. E.g., Hermes-Thoth, El-Kronos or Zeus-Ammon. – Gods may be portrayed in cult differently from myth. E.g., ARes is not the bloodthirsty battle god but a protective deity, guarding community and granting courage. Hera is a Queen, not a Shrew. – Gods who are important in myth may have lesser importance or apparent importance in cult, e.g., Zeus and Poseidon did not have temples built until well into the Classical Age, and at Athens, the Temple of Olympian Zeus was not finished until the time of the Roman Emperor Hadrian in the second century C.E. The first and largest temples were to Hera. – Some poets thought to be divinely inspired, see Homer’s invocations at the start of the Iliad and Odyssey, e.g, “Sing Goddess, of the Wrath of Achilles…” The Muse sang, not Homer. – Many ancients were embarassed by poetic depictions of the gods, e.g., Zeus’s many affairs. – Myths often contradicted each other. 1) Practice, ancient and modern is based on the worship of, and devotion to deities. – Services done in honor of deities — paintings, poems, hymns, charity, etc. 2) Many pursue activities patronized by deities, or reflecting a deity’s interests or sphere of influence. B) Civic/Public religion is modelled on the rites and festivals of the ancient city state. C) Domestic or private religion is the religion of the home. This is usually the main focus of our practice today, as it was in the daily life of most ancients. This is especially true as most of us are solitary. D) The Mysteries and transformative, life-changing cults, often with a focus on ethics and afterlife. People often initiated in several Mysteries. Eleusis, Kybele, Orphic, Bacchic, Samothracian, Isean/Serapian, Mithraic. 1) Initiatory. One initiated into the cult. Often had regular worship activities with other cult members. 2) Private and often secretive to some degree or another. – Some take part in Modern Mysteries to fulfill this need. – Somewhat distinct from “Public religion” (though lines can be blurred, e.g., Eleusis). 1) Oracles were very important in ancient times. People turned to oracles and divination for divine guidance and approval of actions. Seers and diviners played an important and respected role in ancient society. The most famous and respected was the Pythian Priestess of Delphi. – Several people do enter trance/ecstatic states to relay purported divine messages. 1) Philsophers often interpreted and justified the poets on rational/theoretical grounds. 3) Several schools existed with lifestyles and ideologies for members to follow. The term Sect originally applied to the various schools of Philosophy. 4) Many things though today to be “religious” were often or usually found in philosophy then. 5) Philosophers defended the old faiths from Christianity. 1) Rural religion was the religion of the farmers, hunters and shepherds in the countryside. 2) While they also practiced the public religion of the ciyt state and other structures mentioned above, much of their focus was different. – Especially important were the Nymphs, satyrs and river gods, whose waters and presence aided crops to grow. A) Ethics. Ethics as a special field of study was first developed in the West by the Greeks, and term itself if Greek. Even before codification, ethics were practical, according to traditional norms. – Hospitality “Xenia” — the Provision of food, drink and shelter to travellers, suppliants, beggars and prisoners. Very important. Divinely sanctioned and failure to provide hospitality draws the wrath of the Gods, who also test one’s hospitality. – Piety “Eusebia” — Proper respect and awe of the gods. Worshipping them regularly in proper practice, avoiding blasphemy. Also includes Filial Piety. 2) Delphic Maxims – Rules of thumb or maxims, either supplied by Apollo at Delphi, or recorded by wise men or sages, especially the Seven Sages of Greece. Most famous: Know Thyself, Nothing too Much. – Other virtues: liberality, righteous indignation (Nemesis), proper pride, etc. 1) Originally the Greeks held a typical Indo-European cosmology of three divisions: Sky, Earth and Underworld. Mt. Olympus with its roots in the Underworld and its peak in the sky unites all realms. It belongs to the gods. Zeus ruled the sky, Poseidon the sea and earth, and Hades the Underworld. – Became more complicated. Above the sky or ai (aer) was the ether (aithyr). Sea sometimes added to Earth, and Tartarus below Hades. – As science developed, the theory of Celestial Spheres arose. Made of Ether or the Fifth Element (quintessence) it was divine, unchanging. Planet seen as gods or homes of gods. Above the 8th sphere — realm of gods and fire. C) Elements and Atoms: Early philosophers developed one element cosmology. Then Empedocles dvidied the sub-lunar world into Earth, Air, Fire and Water. – Democritus — Atoms, all things are atoms and the void. – Plato — Each element has an atom, which takes the form of a Platonic solid. – Pythagoras — all things arise from Monad, Dyad, Triad, etc. to Tetrakys. D) Divine Hierarchy. The Greeks developed the Great Chain of Being. Sometimes at the top is the One or Monad. Lesser Gods (Horai, Charites or Graces, Moirai or Fates, Nike or Victory, etc. A) Prayer — Prayer was an important element of religion then and now. We offer prayers to pay homage to the gods, show that we remember them, make petitions and vows to them. 1) Form — Prayer is usually offered Standing. The gods do not expect us to kneel before them. We are free and deal with them as free men and women. – Raise arms with palms to heavens. If praying before a cult statue, palms may face the image, or to the sea, tree or river/spring. To the Chthonic deities, palms may face the earth, or one may prostrate oneself on the ground. – Address the deity. Name them, list their epithets if known, especially those relevant to the prayer. – Remind the gods of what you have done for them. – If a vow is being made, state what you will do to fulfill the vow if the deity grants the prayer. 2) A good example of a prayer can be found in Homer’s Iliad, Bk I, where Chryses prays to Apollo. 3) Do ut des — Prayers and rituals are often bargaining in form. You offer the gods something in return for the prayer and petition. 4) Offerings: Offerings are usually made with prayers. It is often said that prayers without offerings are empty words. B) Offerings. Offerings were made with prayers, to induce divine favor, thanks offerings and fulfillment of voews. 1) Incense — the most basic offering and minimum for piety was incense, especially frankincense, though myrrh and fragrant woods and herbs are offered. 2) Lights — small oil lamps were filled and lit for the gods. Today we usually offer candles. I use tea lights as offerings. Some obtain reproduction clay oil lamps for offerings. 4) Statues, Statuettes, and other items are offered on shrines/altars, usually when a shrine is initially dedicated, but at other times as well. 5) Altar service — bowls, candlesticks, thuribles, etc. 8) Parts of one’s meal. 1) Hekates’s Deipnon — Traditionally food was laid at crossroads, especially at the new moon to Hekate. This was later consumed by beggars. Today most make offerings to food banks. 2) People make things, write poetry, act in plays, hunt, learn martial arts and other activities as devotional work to a god. 3) The making of art works for the gods, a devotional activity with a long history. 1) Procession: People gather w/ priests and process to the temple or sacred space, sanctuary or altar. Ritual assistants carry baskets of barley, cakes, offerings, incense, tools, etc. AN image of the deity may be carried in the procession. Musicians would pla. The traditional sacrificial animal would be led to the sacrifice as part of the procession. 2) Purification: The sanctuary has lustral basins to ritually clean on entering. Water is sprinkled, barley is scattered, esp. against the altar. 3) Hymnodia: Hymns are sung. Deity is invoked. Prayer is done. 5) While sacrifice is cooked games may be played to pass time, along with music and poetry, recital of myths, etc. 6) Feast: Ancient sacrifices were bar-b-cues and feasts. Feasts are still a part of worship today. 8) Hestia, goddess of fire, and community, invoked 1st and last. E) Domestic Worship: Without temples and sanctuaries, we worship at home for the most part. Even in ancient times, home worship was central and was the most common religious activity. 1) Household gods — Many of us have patron deities, or favorite deities. We assemble shrines to them and worship them. A great deal of effort goes into this worship and these shrines. 2) Traditional Household gods — The Greeks honored Hestia and Zeus most in their home. – Hestia was literally the hearth fire, source of light, heat and cooking, and the focus of family life. Maintaining the fire was a religious duty, and offerings were regularly made there daily. – Zeus protected the home. Zeus Ktesios a benevolent sanke guarded the pantry and food supply. Apparently symbolized by the house snake. Pray to him for health and prosperity and make panspermia offerings…a lidded jar with handles decorated with ribbons, filled with water, olive oil and seeds. – Zeus Kataibates “Zeus the Descender”, Zeus as lightning. The altar in the courtyard was/is a symbolic lightning rod. – Zeus Herkeios 00 Zeus of the Boundaries. Guards the home and its boundaries from evil influences. – Apollon Aguieus “Apollo of the Street” a tall conical stone with ribbons. Not much used today. – Hekate Triformis at the door to protect the home from negative influences. Prayed to on leaving the home. A very popular household goddess with quite a shrine. – Hermes with a herm a pile of stones or ithyphallic pillar at the boundaries or crossroads. – Herakles — Inscription on the door: Here the gloriously triumphant Herakles dwells, let no evil enter. – Ancestral cult: Every month graves would be visited as well as at annual festivals of the dead. Grave stones are wrapped in ribbons of one color, wreathed, oiled. Food offerings and libations made. Today we often set up an ancestral shrine in lieu of visiting the graves. 4) Noumenia: New moon. Crown and adorn statues of Hermes, Hekate and others. Offer incense and cakes. Prayers offered. Food left at crossroads. 5) One’s Agathos Daimon “Good Spirit” like the Roman Genius or Juno of a person, or the Thelemci and CM Holy Guardian Angel. Libations offered at meals and birthdays. F) Rural worship: People set up small shrines to the nymphs. Many of us make offerings to the nymphs and woodland spirits. One friend of mine cleared and cleaned a spring in his yard, and planted crocuses there to honor the nymph of the spring and makes regular offerings there. Another friend goes regularly to pray to the Williamette river and make offerings to the river god. As in ancient times, with sanctuaries on hilltops, springs, river banks, etc. one man in the Boston area has set up an altar next to a lightning smitten tree as a public altar for services. G) Temples: NO temples have been built today and they would require more believers and infrastructure than we can provide at this time. However, we do have shrines in our homes. 1) Temenos “Space cut out” marked by stones or a wall. 2) With lustral basins at the entrance. 3) Often with a sacred spring, fountain, rock, or trees. 6) The Naos, home of the God, which we consider the Temple proper when we think of a Greek temple. Altar is oriented in front of the door. 7) Other structures: Dining hall,s theatres, colonnades, etc. 8) Worship is outside, in the open air. Few enter the naos. 1) Hiereus/Hiereia: Priest/Priestess. Ritual specialist. At home, head of household serves as priest. Today we often rotate the function in groups, or the more experienced lead the service. – No equivalent of brahmins or druids. – Priest had to maintain ritual purity. – Priests often part time functionaries, often magistrates and politicians. – Only one formal clergy training program today: Hellenion’s. – Some go the ULC route for credentials if they feel the need for them. I have such credentials. – Generally the Asatru dictum: “If you declare yourself a priest and no one laughs, then you are a priest” holds true. 3) Exegetes: Specialists in religious law, ritual and purity. Analogous to Jewish Rabbi (Experts in Torah). Neokoroi has several of these experts for deity. 4) Neokoros (not the group) “Temple Keeper” maintains and operates the shrine. Technically all who build and maintain shrines today are neokoroi. No formal neokoroi exist as no formal temples and sanctuaries exist. Closest analog today: Miko. IV) Divination: Played an important role then and now. 1) Augury — the observation of bird flights and calls, lighting strikes and other natural phenomena. 2) Limryan Oracle — A system like the runes, originally drawing pottery shards with letters on them (with special meanings). Today dice are often used to determine a letter randomly. B) Modern Forms: We use a variety of divination methods commonly used by other modern pagans.